An amusing and thought-provoking compendium of columns, articles, essays and reviews from this acute, knowledgeable and irreverent commentator. In a career that has ranged from Country Life to Wallpaper* − spanning the full range between the two, and latterly including the Daily Telegraph and the New York Times − Tim Richardson has gone, both intellectually and geographically, where few other garden writers dare to tread. There are no articles here about the best ways to grow sweet peas or potatoes: Tim is more likely to venture into the realms of art, philosophy or politics. This collection contains articles which have influenced the way we think about gardens − as well as one or two which proved too hot to handle and resulted in his being fired as a columnist. Tim Richardson is a garden historian, journalist and critic. His books include The New English Garden (2013), The Arcadian Friends: Inventing the English Landscape Garden (2007), Great Gardens of America (2009), and Oxford College Gardens (2015). He writes regularly for newspapers and magazines including the Daily Telegraph, the New York Times and Gardens Illustrated. He is also the author of Oxford University’s course on the history of the English landscape garden, and advises the National Trust on landscape conservation. In 2014−15 he was visiting professor in landscape art at Vienna University of Arts. He is the founder-director of the Chelsea Fringe, the alternative gardens festival. "Delightful...a great read for anyone who likes to challenge the status quo, enjoys gardening or visiting gardens and has ever wished they could stick a literary two fingers up!" "His topics (targets?) are many and varied always spot-on, erudite and beautifully written. I could tempt you with a hundred nuggets but I won't, because every HORTUS reader should leave his armchair right now and go out to buy a copy - preferably from an independent bookseller. You will not be disappointed." "The perfect book for the Christmas stocking – small, compact and a little treasure. It is a collection of Tim Richardson’s columns, articles, essays and reviews and they are, first and foremost, entertaining but also informative and thought provoking. Tim Richardon’s style is witty, insightful, provocative and, above all, enjoyable and fun to read. I loved it! Loved it!" "Wide-ranging..Lots of food for thought"
"Here is a collection of articles, essays, reviews and columns written for various publications between 2004 and 2015, on a huge variety of subjects. Some are amusing, some thought-provoking and some are downright contentious. All are worth reading. Tim Richardson is a practiced writer and reviewer of gardens, styles of gardening, designers, and gardeners both living and historic… whether you agree with his views or not, there’s no denying he expresses himself clearly and persuasively." 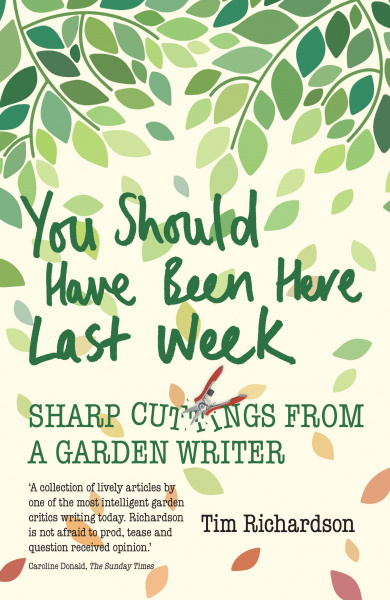 "The most independent, thoughtful, challenging gardening critic writing now. Every article here makes entertaining reading as well as being well worth pondering." "Incisive, witty, opinionated and thought-provoking, its subject matter is engagingly eclectic." "There is lots of meat (or maybe high quality protein, if you prefer) in these short pieces – plenty to think about, discuss, and to challenge your thinking about gardening. And he is a good writer rich in quotable passages, sometimes cutting, controversial even. It is worth buying, this book and it is not even expensive. I wish there was more garden writing of this quality." "A collection of short pieces by the marvellously opinionated, self-assured author and historian Tim Richardson...genuinely stimulating." "Informed criticism of what contemporary designers are up to is hard to find, but you can depend on Tim Richardson - the best, indeed almost the only, garden polemicist we've got." "A collection of lively articles by one of the most intelligent garden critics writing today. Richardson is not afraid to prod, tease and question received opinion." "Witty and full of perceptive comment." 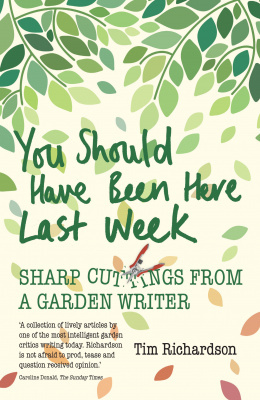 "Tim Richardson is our most critically intelligent, observant and humorous garden historian." "Noone writes better than the English gardening scene than Tim Richardson. He has a formidable range of reference and a brilliant way with words."